Wait a minute! That doesn’t mean I’m not going to do anything in this post. If you went through that article already then you may have noticed that on the server side they are using a ConcurrentDictionary to store the todo items in the memory. Problem is if I stop the project, all my todo items will be wiped out of the memory. So, we need a persistent data storage system. We could have store them in a simple file system but why don’t we store them in a database? 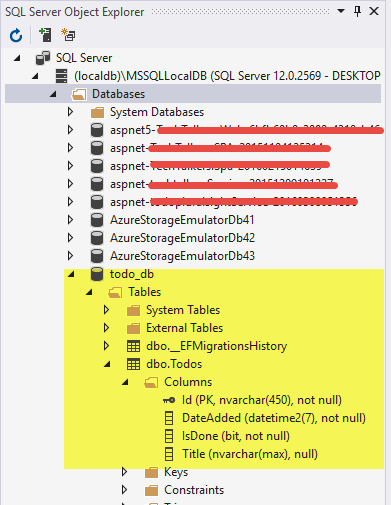 Before using the Todos DbSet in our TodoRepository (Repositories are responsible for working with data) we have to configure a database connection for the project. Add a ASP.NET Configuration File in the project. By default it will create a ConnectionStrings node where a connection string is placed in the DefaultConnection node. Here in the constructor, we are building a configuration root which eventually stores the configurations defined in the appsetting.json file as a key-value pair. Then in the ConfigureServices, we get the default connection string by its key. Entity framework can work with a wide range of database systems. 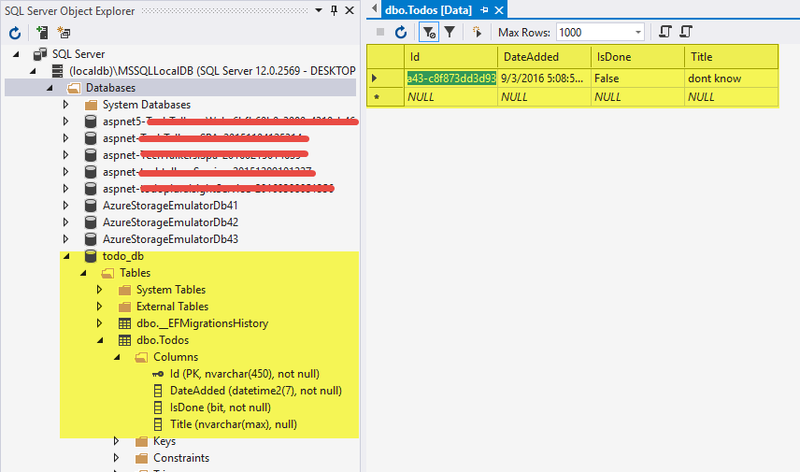 Since we are using SqlServer here, so we are configuring it in the option of the AddDbContext<TodoContext> with our connection string. As you can see we are doing basic CRUD on the Todos DbSet with the help of the TodoContext. Nothing more to say here because everything is self-explanatory. But always remember to call the SaveChanges() function on the context when you are doing something on the database table and need to save the changes. Without calling it nothing will be changed. Also notice that when we are saving a todo item, we are adding the current date and time within the DateAdded property and generating a new GuId to set on the Id property. The Id is for the todo to have a unique identity in the database (Primary Key). Also we are setting the IsDone status property of the todo item to false. And we are done! 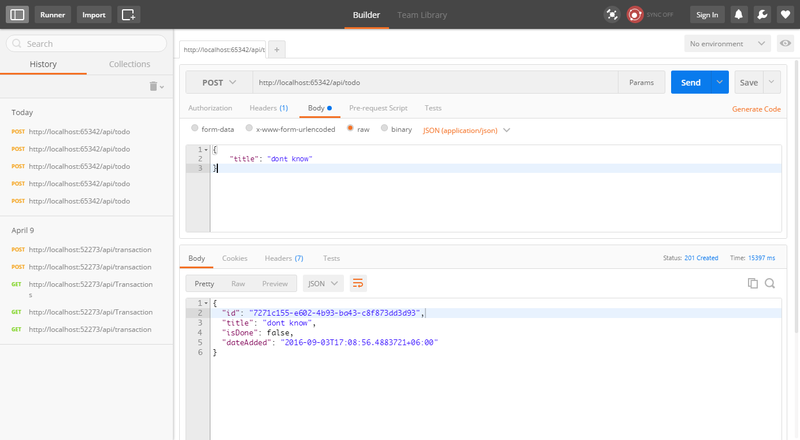 Now we can call our APIs from postman(a REST client) and if we add a new todo it will be added directly into our database. Then of course we can update or delete it if we want with the help of other APIs. Next up, we will see how to make ajax calls to these APIs from Polymer. Till then have fun.